Are you subscribed to our newsletter? Well, it's never too late to do it right! Indeed, we proceed at the end of each month to a draw that will allow you to win an exceptional lot! This month, we decided to spoil you by putting a kit into play Avenger 270 TC by iJOY and an intelligent speaker Google Home". SUBSCRIBE AND TRY TO WIN FOR 280 EUROS OF GIFTS! Thanks to our newsletter, you will not miss the news of the electronic cigarette! Information, reviews, batch info ... You just have to open your e-mail box to know everything that happens! In addition, to thank you, we will offer each month a unique lot to one of our newsletter subscribers! To participate in our draw, simply sign up for our newsletter through the form below. The draw will take place each end of the month and the winner will be announced here! So ? 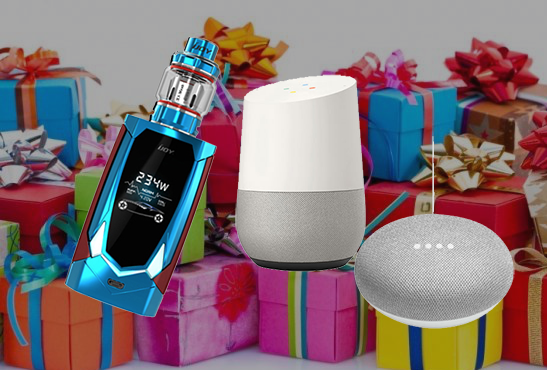 Who will win this Avenger 270 TC combo and Google Home? * And participate automatically in our draw! Following : TAIWAN: The government is worried about the increase in vaping among young people.